The use of Monte Carlo simulations in diagnostic medical imaging research is widespread due to its flexibility and ability to estimate quantities that are challenging to measure empirically. However, any new Monte Carlo simulation code needs to be validated before it can be used reliably. The type and degree of validation required depends on the goals of the research project, but typically, such validation involves either comparison of simulation results to physical measurements or to previously published results obtained with established Monte Carlo codes. The former is complicated due to nuances of experimental conditions and uncertainty, while the latter is challenging due to typical graphical presentation and lack of simulation details in previous publications. In addition, entering the field of Monte Carlo simulations in general involves a steep learning curve. It is not a simple task to learn how to program and interpret a Monte Carlo simulation, even when using one of the publicly available code packages. This task group report provides a common reference for benchmarking Monte Carlo simulations across a range of Monte Carlo codes and simulation scenarios. All simulation conditions are provided for six different Monte Carlo simulation cases that involve common x-ray-based imaging research areas. For all cases, the results obtained with four publicly available Monte Carlo software packages are included in tabular form. In addition to a full description of all simulation conditions and results, a discussion and comparison of results among the Monte Carlo packages and the lessons learned during the compilation of these results are included. This work provides an investigator the necessary information to benchmark his/her Monte Carlo simulation software against the reference cases included here before performing his/her own novel research. In addition, an investigator entering the field of Monte Carlo simulations can use these descriptions and results as a self-teaching tool to ensure that he/she is able to perform a specific simulation correctly. Finally, educators can assign these cases as learning projects as part of course objectives or training programs. 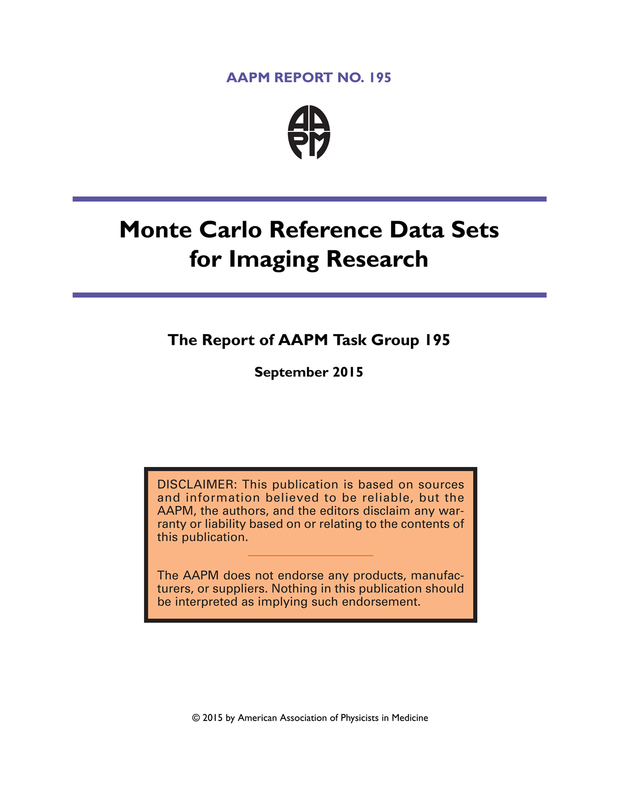 *Note: Electronic Resources of the TG 195 Report "Monte Carlo Reference Data Sets for Imaging Research" can be accessed here.